Spring has sprung and things are moving for Catherine Babault Photography! An article about Catherine Babault Photography was published in the March edition of the magazine L’Entr’aînés, a monthly publication of l’Assemblée Francophone des retraités et des aînés de la Colombie-Britannique. You can read it here. In April I had an interview on Radio Victoria to talk about my workshops and my passion for photography. Listen here. 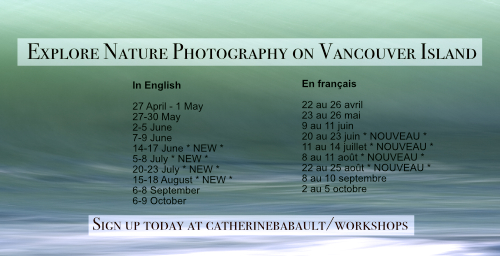 Eight multi-day workshops have just been added for this summer: 4 in English and 4 in French. They will be given in the greater region of the Comox Valley, in a radius of 60 km. We will cover the art of composition, use of light, creativity and workflow. I will take participants to some of my favourite spots to photograph nature and wildlife. This should be fun! Check for upcoming workshops and new fine art prints or follow me on Twitter for the latest news!